A forecast issued this week by global organisational consulting firm, Korn Ferry reveals that, adjusted for inflation, real-wage salaries globally are expected to grow only an average of 1% in 2019. This is down from a 1.5% prediction for 2018. Although top-line salaries will increase by 7.7% in Africa, high inflation means the real increase is predicted to be only 0.9%. For example, in Egypt, on average salaries are expected to increase by 15%, but a 14.4% inflation rate means employees will only see a 0.6% real-wage increase. Said Malcolm Pannell, Managing Director for Korn Ferry, Sub-Saharan Africa, “Reward in Africa presents many unique challenges for companies. Models often differ from more traditional/global models in that the pay mix can be very different. Benefits and allowances can be vastly higher than those in more mature markets due to a wide array of subsidies, including housing, generators, fuel, transport and even food, because of infrastructure difficulties. In turn, variable bonus pay can be much lower due to a lesser focus on individual performance. 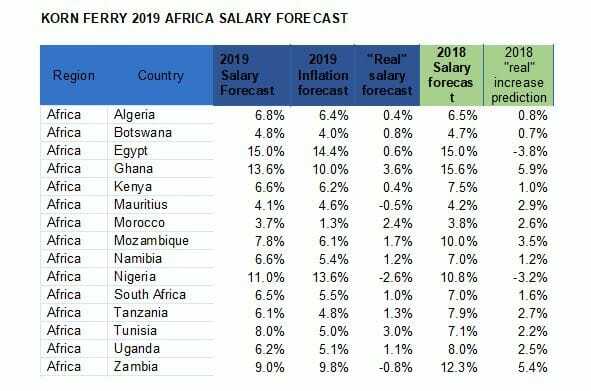 The 2019 salary forecast in Africa indicates that Egypt, Ghana and Nigeria have the highest nominal increases, all being over 10%, while real salary growth is predicted in Ghana, Morocco, Mozambique and Tunisia. With a nominal 6.5% increase, South Africa is expected to maintain a 1% real increase in 2019, down slightly from last year’s prediction. Regionally, Asia is expected to see the highest real wage growth, with salaries forecast to increase by a real 2.6% of these, China’s real-wage forecasted growth for 2019 weakened at 3.2%, down from 4.2 % last year. In North America, both the United States and Canada are predicted to achieve a real-wage growth of 0.6 %. Employees in Eastern Europe are predicted to see an average salary increase of 2% after accounting for inflation, and in Western Europe, salaries are forecast to increase by only 0.7%. Employees in two of Europe’s largest economies, France and Germany, are forecast to see real-wage rises of 0.5% and 1% respectively. Wages are predicted to increase 2.5% in the United Kingdom, however with a 1.9% inflation rate, real wages are expected to increase by 0.6%. In the Middle East, wages are expected to increase by 3.6%, compared to 3.8% last year. Inflation-adjusted wage increases are predicted to be 0.4%. In Latin America, employees are forecast to receive an average real salary increase of 1.3%. The Pacific sees the lowest prediction in real salary increases, with an inflation-adjusted forecast of only 0.3%. Caption: The data was drawn from Korn Ferry’s pay database which contains data for more than 20 million job holders in 25,000 organisations across more than 110 countries. It shows predicted salary increases, as forecasted by global HR leaders, for 2019 and compares them to predictions made at this time last year regarding 2018. It also compares them to 2019 inflation forecasts from the Economist Intelligence Unit.